This picture circulated on an email list a few years ago. The young woman is purported to be Martha Bull’s sister, Rebecca Hogan Bull. Rebecca was 4 years younger than Martha. It’s said she was born in Georgia 18 Jun 1826 and died in Falls County, Texas 10 Dec 1905. I have yet to find her place of burial. Looks to me like she had beautiful brown eyes and dark hair. Since I have never seen a picture of Martha (my ggg-grandmother), I like to look at it and think that maybe the sisters looked very much alike. This picture is of Oliver John Scarborough and Rebecca H. Bull. It is their wedding photograph. 1. OLIVER JOHN1 SCARBOROUGH was born 04 Oct 1826 in Alabama, and died 21 Aug 1862 in Drew County, Arkansas. He married REBECCA H. BULL 19 Jul 1848 in Drew County, Arkansas, daughter of ROBERT BULL and SUSANNAH SULLIVAN. She was born 18 Jun 1827 in Pike County, Georgia, and died 10 Dec 1905 in Falls County, Texas. Oliver J. Scarborough, b. Oct 4, 1826 d. Aug. 21, 1862, b. in Miss. Rebecca Homes Bull, b. June 18, 1829 d. Dec. 10, 1905, b. in Ga.
James L.	b. Sept. 15, 1849	d. Feb. 20, 1921	b. in Ark. David L.	b. Mar. 15, 1851	d. ? b. in Ark. Henry H.	b. Dec. 3, 1852	d. 1889	b. in Ark. Christine Laura	b. May 2, 1855	d. 1954	b. in Ark. Amerca S.	b. Feb. 10, 1857	d. 1867	b. in Ark. Baby	b. Dec. 2, 1855	d. 1855	b. in Ark. Mary L.	b. Feb. 23, 1859	d. ? b. in Ark. Oliver J. Scarborough d. in Ark. Birth places of Oliver J. and Rebecca taken from 1880 Census (Henry Scarborough) in Falls County, Texas. David L. King — b. Aug. 1, in Scotland d. May 12, 1835 in Miss. Res. South Carolina Service. He was in S.C. Militia under Capt. John Starks. He was a Corp., then a Serg. and Capt. Cavalry S.C. Militia. After the war he stayed in S.C. nine years then went to Ga. for 14 years. When he came to Miss. he settled in Franklin Co.
1820 Census of Ga. (Wilkinson Co.) lists David Homes, the only H-o-m-e-s I’ve found. Mention that because Rebecca carries the name Rebecca Homes Bull. You can take it from there and play with it, maybe an inquiry to D.A.R. might give a good lead. Aunt Laura Christine Scarborough Copeland, (who lived to be 99; died in Lancaster, Texas) told me that my great grandmother, Rebecca was descendant from the Bulls of England. I corresponded with Mrs. Gandrud (professional genealogist) and she sent me the 1850 and 1860 census of Perry County, Alabama. From the census record I established the fact that A. Melson also A.H. was the grandson of Nancy Melson who in 1850 was a widow. (Her age was given as 70 and Archibald was 28 in 1860). From a copy of her Will (Dallas County, Alabama) dated July 27, 1867, no mention was made of Archibald. The names of sons in Will corresponded with census records. All were accounted for with the exception of a son, R.K. whom I believed to be the father of A. The probation gave the address of survivors with the exception of R.K. According to records the estate was never settled. A son, James H. was in Grimes County, Texas in 1867. I assumed that an uncle in Texas prompted Archibald (with two young daughters, Sarah about 12 and Susan about 10) to leave Alabama and come to Texas after Nancy died. The story Archibald hired a mule train and went to east Texas to buy lumber for a house — he never returned — supposedly died from illness and I guess — was buried by the side of the road. A Mexican reported on the return of the mule train — “He no die, he robbed.” An inquiry to the County Clerk of Grimes County for record of deed; netted no reply. If you are not ready for a snake-pit, I’m ready for a white-jacketed attendant. Will send RAY when I recover. (signed) Pauline. The 1850, 1860 census of Perry County, Alabama lists Mrs. Nancy Melson, sons John, James, Elijah and W.R. as being born in So. Carolina. As I mentioned before; son R.K. was not in Perry County or Dallas County. I have not been able to find marriage record for Archibald. Samuel Melson made application for pension (Revolutionary) in 1833, in Greenville District of So. Carolina. He was ninety-seven years old. Born in Conn. It’s possible that he’s the big grandaddy of the Perry County Melsons. The audited account — keep, I have two. I want to work on the RAY line next. I’ve just about completed the D.R.T. application for Phyllis. Received copy of Headright certificate to Epperson W. Harper, Sept. 8th, 1841. Not bad, not bad! (Ira’s great-grandfather). I would like for you and Betty to go the David King rought — I’m anxious to have a follow up on him. Note: Oliver influenced the naming of the children along the Scarborough records. Residence: Moved to Texas after death of first husband, Oliver J. Scarborough. i.	DAVID L.2 SCARBOROUGH, b. 15 Mar 1851, Arkansas. ii. HENRY H. SCARBOROUGH, b. 03 Dec 1852, Arkansas; d. 1889; m. SUSAN MELSON, 01 May 1879, Falls County, Texas; b. Abt. 1856, Selma, Alabama; d. 11 Mar 1918, Falls County, Texas. iii. AMERICUS SCARBOROUGH, b. 10 Feb 1857, Arkansas; d. 1867. Property: Americus died in his youth. iv. MARY E. SCARBOROUGH, b. 23 Feb 1859, Arkansas. Property: Mary E. died in her youth. v.	JAMES L. SCARBOROUGH, b. 03 Sep 1849, Drew County, Arkansas (later Ashley Co.); d. 20 Feb 1921, Falls County, Texas; m. SARAH A. MELSON, 10 Sep 1871, Falls County, Texas; b. 16 Jan 1850, Selma, Dallas County, Alabama; d. 15 May 1920, Falls County, Texas. Census: 1860, Falls County, Texas listed James L. Scarborough and his wife Mrs. Melson. Occupation: James and Sallie owned general store in Wilderville, Texas. This store remained family owned until 1975. Property: Family history from Lenna Buchanan, dau of Joseph Green Atkins and Willie Etta Scarborough. vi. LAURA CHRISTINE SCARBOROUGH, b. 02 May 1854, Drew County, Arkansas; d. 25 Sep 1953, Age 99, Pittsburg, Texas. ; m. JOAB COPELAND, 11 Jan 1872, Falls County, Texas; b. 16 Feb 1847, Near Hurricane Creek, Perry County, Tennessee; d. 16 Apr 1915, Temple, Texas. Census: 1850, Her family listed in Drew County, Arkansas. Note: Lived to be 99. Died in Lancaster, Texas. Said that Rebecca Bull Scarborough Meeks was a descendant of the Bulls from England. Residence: Resided with her daughter Edna and son-in-law, Jim Martin, in Pittsburgh until she passed away. JOAB COPELAND was born in Perry County, Tennessee near Hurricane Creek February 16, in 1847. He was the son of JAMES COPELAND AND STACY (ANASTASIA) WEBB COPELAND. When he was about 4, in 1851, his family migrated to Washington County, Texas and later settled in Falls County near the Brazos River. JAMES AND STACY COPELAND had several children that came with the family from Tennessee and it is possible some of their descendants are still in the Central Texas area. According to Falls County Records Vol. I, 1870, he first married NANCY J. BURNEY on February 2, 1870. She died in childbirth. 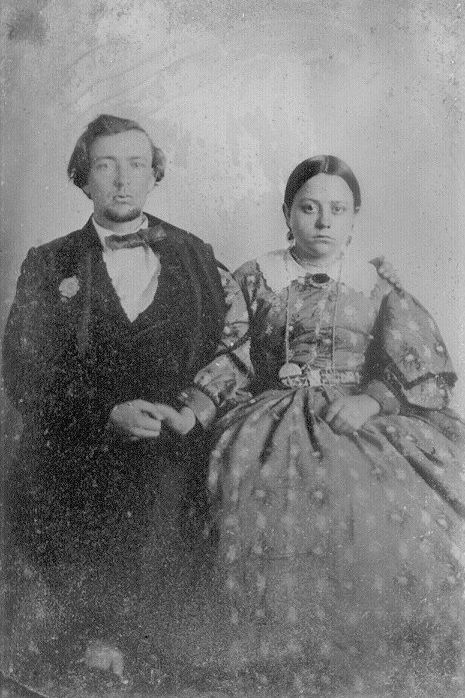 JOE O. married LAURA CHRISTINE SCARBOROUGH January 11, 1872 in Falls County, Texas. JOE O. and LAURA had 12 children ; Seth , Cary, Fountain, Infant son b. August 16, 1878 d. August 27, 1878, buried in Jena Cemetery, Florence b. April 1882, James b. March 1884, Edna b. October 1886, Homa b. May 6, 1898 d. February 14, 1900, buried in Jena Cemetery, Joe Hal b. February 10, 1889 , Laura Christine b. January 1891, Powell b. May 1883, and Floyd Ray. LAURA CHRISTINE was born in Drew County, Arkansas May 2, 1854. Her family is listed in the 1850 census of Drew County, Arkansas her father, OLIVER J. SCARBOROUGH b. 10/4/1826 in Alabama and d. 8/21/1862, Drew County, Arkansas. Her mother was REBECCA HOMES BULL b. 6/18/1826, Pike County, Georgia and d. 12/10/1905 in Falls County, Texas. It was after the death of her husband that REBECCA BULL SCARBOROUGH moved her children to Texas. There she met and married a Mr. MEEKS, they had no children. LAURA lived until September 25, 1953 and is buried in Crossroads Cemetery near Pittsburgh, Texas. She had lived there with her daughter EDNA and Jim MARTIN for many years. LAURA had reached the age of 99 years of age when she passed away. JOE O. COPELAND served as a private in Company F, 14th Regiment, Texas Infantry, CSA. His name appears on the regiment roles for the month of April 1864, which shows him sick and left near Rake Pocket on March 20, 1865. No record of enlistment or later service has been found to date. In September 1887, JOE O. COPELAND was a private in CAPTAIN WILLIAM SCOTT’s Company F of the Frontier Battalion. This battalion was part of the Texas Rangers and originally was organized to fight Indians. Later these units were to maintain law and order and in 1901 the Frontier Battalion was organized by the Texas Legislature as the Texas Ranger Force. By trade JOE O. was a cotton ginner and carpenter. He built a boarding/rooming house in Temple, Texas , across the street from Kings Daughter Hospital , that he and LAURA owned and operated. This house is still standing and is located at 303 South 22nd Street in Temple. JOE O. was a Mason, member of the E. M. Wilder Lodge in Temple, Texas. He was initiated on November 15, 1872, passed on February 20, 1874, and raised on March 28, 1874. The date of his death is April 15, 1915. He is buried in Jena Cemetery in Falls County, Texas with his two infant children. Census: 1900, Joab and Rebecca Bull Meeks listed as mother in law as living with them. Also, Dicy, another sister of Joab. Mason member: 15 Nov 1872, E.M. Wilder Lodge in Temple, Tx., passed on 02/20/1874, raised on 03/28/1874. Military service: Apr 1864, Private in Company F, 14th Regiment, Texas Infantry, CSA. Records indicate he became sick and left near Rake Pocket on March 20, 1865. Occupation: Cotton ginner and carpenter. He built boarding/rooming house in Temple, Tx, across street from Kings Daughter Hospital, that he and Laura owned/operated. This house is still standing at 303 South 22nd Street in Temple. Residence: 1847, Lived in Perry County, TN until 4years old, then moved to Washington County, TX. vii. BABY SCARBOROUGH, b. 23 Feb 1859, Arkansas; d. Aft. 23 Feb 1855, Arkansas. Family researcher for Ambrose and Elizabeth Johnson BULL families. I’d be very interested in talking with you!! Oliver and Rebecca are my gggg grandparents!